Well, I beggining to see The Light! An old harbour of the Cape city calling seaships, captains and sailors. High handed torch shining over the world. All in the Good Hands. All in the God Hands. Raigardas Kudirka was born in 1966 in Vilnius, Lithuania. His family, a combination of French, German, and Lithuanian, was very artistic. 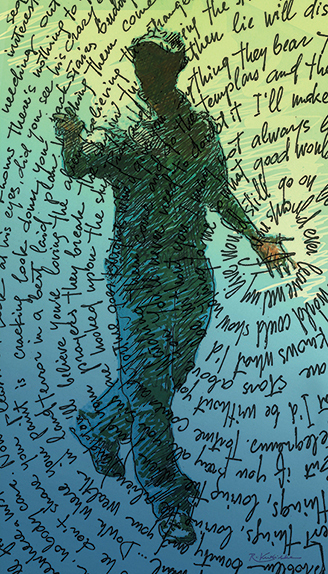 Inspired by comics, he started with drawing graphics at age 10. Later he discovered painting with acrylic and oil paints. For a few years he worked in advertisement and as a stage painter. He also was singer in choir and local rock band. All of his life he has been inspired by modern arts, from surrealism to pop art, total abstractions to photo realism. He is mostly interested in subconscious construction and fabrication of life, connections between dreams and reality. Raigardas Kudirka once said that “people see the world as they know it” and this is what he aims to capture. He works mainly as a painter and is better known as surrealist. He also does photography, studied and works as a digital artist, and even sometimes as an illustrator. 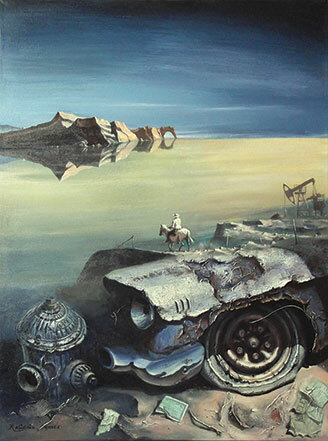 "Chevroland" depicts a surrealistic landscape with horsemen riding home. 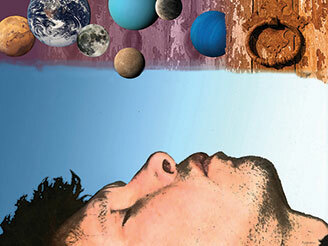 "Planet Caravan" is a digital conversation with dream. Sleepy knowing about Universe. "If I... Angry Man" is a digital and drawing scene of misunderstood person.